Saddle stich brochures, manuals or any other printed material is one of the best ways to increase your business, in a large or smallm manner. Brochures are one of the most diverse marketing mediums available since they are suited to a wide variety of situations. They serve as an interactive guide when explaining products and services, and point out key features and benefits to the customer. Since brochures are so inexpensive, they represent the perfect pitch when operating on a smaller budget. Saddle-stitched binding is among the easiest and most common methods of booklet binding. It is a soft type of binding which uses staples on the seam or spine of a book or a booklet where it folds. It is ideal for binding smaller booklets that don't have plenty of pages, such as books, brochures, and catalogs which are under 100 pages. Our saddle printing service comes along with a variety of paper, page count and sizes for your custom booklets. You can also choose from different paper types for the inside pages and cover of your booklets. Customizing your own brochures has never been easier. We make it possible to do almost anything with your brochure, whether it is an 8.5" x 11" or 5.5" x 8.5". 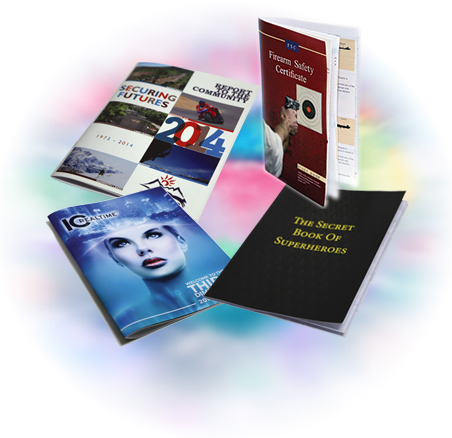 If you need 50 brochures or 5,000, our state-of-the-art printing press delivers a highly quality professional full-color printing at a very low cost. We can also save you time as well as money with our mailing list and direct mailing services.